Have you noticed your organic reach decreasing on Facebook over the years? Are you wondering how you can turn the negative trend and reach more people without paying for Facebook ads? Also, you’ll be glad to hear that there are approaches that you can take to battle the decreased organic reach you’ve been seeing. In this article, we’ll take a look at how the Facebook algorithm works in order to understand how you can optimize your content for maximum exposure and reach. Facebook ranks and displays your content with the help of several advanced criteria. Facebook’s algorithm looks at all the posts made by your friends and the pages you follow when you open up the platform. The algorithm then takes an inventory of that content to better understand what is being shared. Facebook then carefully goes through all of that content (even though it just takes a millisecond to do so) and tries to decide what content is relevant to you based on your previous engagements and activity and then ranks that content based on relevance. 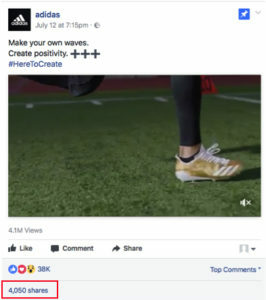 Based on the information they have of what you find relevant, and what content has been shared, Facebook uses those “Signals” to try and rank the content in your feed. Apart from only looking at your previous engagements and activity, the algorithm also includes a ton of other criteria in the equation. You can think of it like your meals of the day: if it’s morning, the chances are you’ll want breakfast and not dinner. With the information Facebook now has, the algorithm makes predictions on how valuable the content is for you, for example, how likely you are to like or comment on a certain post, and how much estimated time you’ll spend looking at it. When Facebook has taken everything into account, the algorithm then sorts the shared posts based on relevance. In that way, the “Score” works as a “relevance score” based on how interested Facebook believe you will be when ultimately presenting the content in your feed. Of course, Facebook can’t know how interested you’ll really be, but the information is based on an estimated guess based on your previous history. This complicated process reoccurs every time you open up the app. A big deciding factor in the content ranking is who you become friends with and what pages you start following. Seen as it is you who perform these actions, they often reflect the user’s interests very well. This means that Facebook also looks at the interests your friends and the pages you follow have and the type of content they share. Since these are the people whose content you will get in your news feed, it seems reasonable that Facebook would choose to use this metric. The way Facebook displays content is, as now explained algorithm based. This means that the posts you’re seeing are not in a chronological order and posts from several days ago can end up in the top of your feed. As more and more content started to be posted on Facebook in the pace that the platform grew, people could no longer keep up with all the content people share. At least that’s the reason for introducing the algorithm based feed according to Facebook. The first reason Brian mentions is competition. As more brands, and regular people for that matter have flocked to the platform, more content is being shared. This means that the competition between the brands is greater than even, while there only is so much attention of your audience that you can catch. 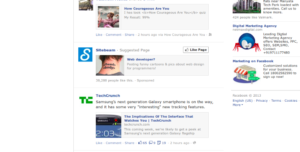 As a result, Facebook now tries to figure out what content you like and present only the most relevant to you. What happens then is that Facebook will sort out a huge chunk of content away from your feed, not letting them see the light of the day. Whereas back in the day, all the content that was posted was presented in your feed, today, only a small percentage of it is put in your feed, resulting in a huge decrease of post engagement for the distributors. Many people have accused Facebook of limiting the reach of posts only in order to make more money. 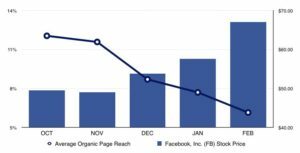 As organic reach has decreased, many brands have turned to Facebook ads in order to boost their posts and get more reach. While Facebook completely denies these accusations, it’s not really a secret that their revenue has increased dramatically since they introduced their algorithm – and have year after year decreased people’s organic reach. The connection is quite clear, but whether or not Facebook has decreased organic reach solely for more income is up to you to decide what you believe. 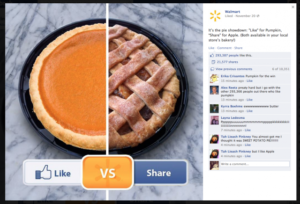 Does organic content still have a place on Facebook? Once again, Facebook tends to try to convince people that organic content still has a place on the platform, however, they are in a discrete way recommending you to use Facebook Ads – as you would expect. 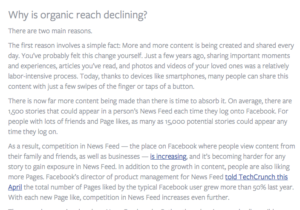 Read the full article about Facebooks organic reach decline here. So how can you increase your organic reach? We’ve looked at how Facebook’s algorithm works and how it sorts our content, we’ve looked at why the organic reach is declining, so let’s look at what approaches you can take to reach more people organically, even though the organic reach is dramatically decreasing. Organic reach is an important part of social media marketing. No matter if you have a budget allocated for social media promotions, you, of course, want to get as much organic reach as possible. The single most important part of increasing your organic reach on Facebook is sharing content that’s valuable, relevant, interesting, and provides value for your target audience. If your posts don’t provide this, you’ll appear in fewer people’s feeds, and for many, your posts won’t see the light of the day. The tips below will help you optimize your Facebook posts, and improve your Facebook presence, which will ultimately result in a bigger organic reach. Negative feedback is an indication to Facebook that your content isn’t valuable, thus resulting in a decrease of organic reach. Therefore, you want to make sure all your content is perfectly proofread and double-checked before posting. Also, you want to make sure you aren’t distributing any dead links or links that direct your audience to a page that doesn’t provide value because this will harm the user experience – something that Facebook certainly don’t want to happen. The less negative feedback your posts get from these types of mistakes, the more reach you’ll have both long- and short-term. Now, we know that negative feedback is an indication of bad user-experience. In contrast, positive feedback will be the opposite. To get positive feedback, you want to share content that receives positive feedback from your audience in the form of likes, positive comments, and reactions thus resulting in a slight increase in organic reach. As we spoke about earlier, when engaging with a post, Facebook sees it as an indication that you like the content that you engaged with, thus increasing the likelihood of getting another post from the same user again. In addition to that, the friends of the user will be able to see that their friend has engaged with a post, which potentially could spark their interest, resulting in them checking out the post. Questions are engaging and inclusive, and asking them in your post might (and often will) help you receive more engagements to your post. Asking people to vote or tell you what they think about your post is a great way to get them to hold up for a second and express their thoughts. As mentioned above, the algorithm also looks at the time you spend with a post, so getting people to spend some time with your post is also a positive indication to Facebook’s algorithm. When someone shares your post, you’re not only getting the algorithm to understand that a person liked that post, but you’ll also get exposure to the friends of the person who shared the post. This is a double-win in terms of getting more reach on your post. Whether it is on an image, video or website link, getting people to click your content is a great indication of interest. By keeping a consistent posting schedule, you let people know when they can expect a post from you, thus possibly resulting in them going to the platform to see it. Facebook might punish you for sharing content that breaks their rules, resulting in an even further decreased organic reach as a penalty. Avoid sharing naked, graphic or pornographic content, and avoid using click-bait. Simply ask your followers to “turn on post notifications”. This means that every time you post new content, your followers will get a notification every time you share new content. More engagement and fast engagement on your posts can help you get a bigger reach because it works as an indication of popularity to the algorithm. The chances are that there are brands similar to yours on Facebook. Many of these have also built their Facebook following and attracted people in your target audience. Reach out to those brands/pages and ask if they would be interested in doing a shoutout for shoutout. You promote them in a Facebook post, and they promote you. Simple! In that way, you can attract new people who aren’t already aware of your brand without spending a dollar on Facebook ads. It’s a win-win! Facebook’s organic reach has been dramatically decreased over the years thanks to Facebook’s algorithm, and many brands that build their whole business with the platform – completely organic, have abandoned it for others methods to gain free exposure. But just because the organic reach is heavily decreased doesn’t mean it’s impossible to get great results from it. By simply understanding how the algorithm works and then sharing content that will work to your advantage, you can still get some great exposure – without paying for Facebook ads.